What is Yat Gaw Mein? Yat Gaw Mein is a popular Asian noodle soup with meat and vegetables. More specifically, it is a thick light-colored hot broth with oriental wheat pasta, meat/poultry/seafood and vegetables. It is so popular because it is tasty, low-cost and filling. This dish can be called a variety of similar sounding names, including Yakta mein and Yaka mein in many Chinese restaurants in New Orleans. Yat Gaw Mein is the name often used in Baltimore’s Chinese carry out restaurants. Some people may call the dish differently, such as “yack-a-me”. Yat Gaw Mein can consist of roast or stewed chicken, beef, pork or seafood. It also has thick wheat noodles in a ketchup sauce or brown gravy, with sliced onions and sometimes also half a hard-boiled egg. It was introduced to the US by troops at the time of the Korean War, based on the noodle soup dish they had in Korea. Yat Ga Mein seems to have changed a little since the 90s – in my opinion the splices of meat were larger, and it usually came with half a hardboiled egg. The broth seemed to be lighter than the ones I’ve seen lately in carry out restaurants. 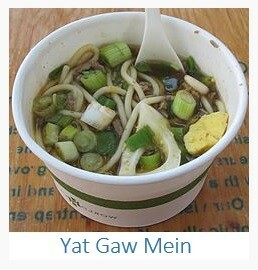 How do you make Yat Gow Mein? To cook this dish right, you will need the right type of noodles, ingredients, and consistency. In a wok heat oil on medium heat and sauté garlic, ginger and scallions. Add meat and stir-fry on high heat for 3 minutes. Add vegetables except snow peas. Cook for 3 minutes. Add chicken stock. Cook for 2 minutes. Add snow peas and noodles. Cook 5 minutes and serve hot with the egg-half placed on top. If you are on a carbohydrate diet or are gluten-intolerant, you can order or cook Yat Gaw Mein without the noodles, just with meat, vegetables, and broth. You will find different recipes for this dish; some of them include ingredients like Cajun seasoning, onion powder, black pepper, soy sauce, hot sauce, Worcestershire sauce, and ketchup. Yat Gaw Mein’s ingredients and taste make a dish along the lines of Chop Suey – a noodle-based dish adapted for American tastes. Every chef and every restaurant makes their Yak Gae Mein a little differently, but it’s always a great tasting and filling meal.